Last update (Oct 17, 2009): Bought the G11 instead of the S90 because of the feel and handling. This post is a compilation of Canon PowerShot G11 professional and user reviews, owner opinions and experiences, tests, conclusions, ratings and feedback. For me, I thought I had settled on the S90 until I went to Best Buy and handled both the S90 and G11 for the first time. I found the S90 to be to small for me and the ease that the rear dial moved was a deal breaker for me. The bigger size of the G11 was not an issue for me. For only $70 more, the G11 feels like ten times more camera than the S90 though I am sure the image quality is probably the same. If you’re still on the fence deciding whether to purchase the Canon G11 or Canon S90, read the two-part forum post extravaganza by ebrandon (Part 1, Part 2), which details the differences and similarities between the Canon G11 vs Canon S90. Canon G11 ISO (“pre-beta” version) noise test — 100% crops at pixinfo.com — The link to this Hungarian site was shared in a DPReview forum post. You’ll be able to evaluate the noise characteristics at ISO80, ISO100, ISO200, ISO400, ISO800, ISO1600, ISO 3200 and ISO 12800. We had the Canon PowerShot G11-et, as pre-beta version received show, but some have received permission to communicate test picture. However, it is important to know that this is not certain that the final state model (although the firmware version 1.0). Advanced elemezgetésbe not now engaging, because the image is subject to change, but it now appears that the modes with high sensitivity (ISO1600, ISO3200) less noise than the previous G models (similar to the resolution of the G7 or the new G10 ). In any of the promising low noise. ISO12800 sensitivity of the photo made a few light mode, then the machine can only answer so high sensitivity, if it really is very light (which is the longest shutter speed then 1 / 15 sec). ISO10000 is only a little more light-et, not even a hair’s breadth more light with ISO5000-ET offers the G11. Unfortunately, this mode is not possible to use exposure compensation, so the test picture dark enough in Latvian. “You can also zoom in and out with the zoom lever during shooting”. “If you change the composition of your shot during shooting, the focus will stay the same but the brightness and tone will automatically adjust”. So yes you can zoom, but your subjects must be relatively still. So no sports day videos then! The G11 seems to have a very limited movie mode. Electricpig was one of the first sites to post a couple of hands-on photos of the new Canon G11. 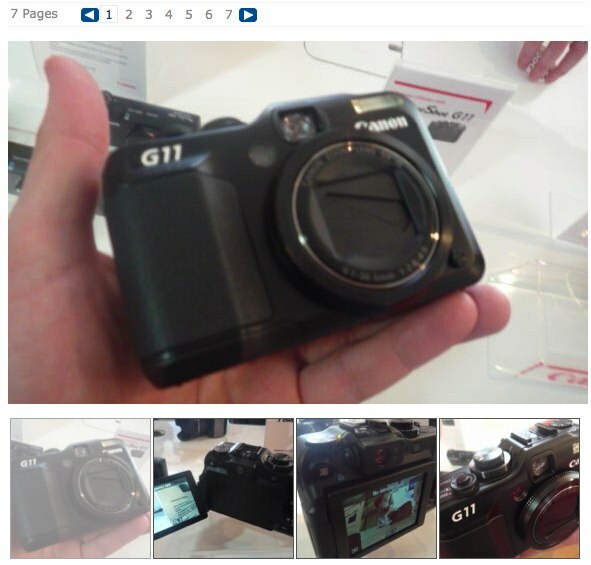 Engadget also has a short, Powershot G11 hands-on post, but the photo gallery has images with much higher quality than Electricpig’s. In this stage of my life, I hate hauling around my DSLR and lenses. I’d rather have a first rate Point-and-Shoot camera to take along with me. […] I really want a camera with a viewfinder when the sun is just too strong, and a camera I can manipulate manually. The G11 looks like it fits the bill for me! Ebrandon has shared two sets of images of night scenes taken with the Powershot G11 in two forum posts. The two posts also compares the G11 to the S90 with regards to low-light shooting. … the S90 and G11 are both exceptionally good P&S cameras for night, indoor, low light, or artificial light shooting. First, the AF (autofocus) is very fast and very accurate in low light. You just forget about this as an issue and shoot away. Second, the IS (image stabilization) works exceptionally well on both cameras. Third, the auto white balance (AWB) on these camera is nothing short of miraculous. I have shot Canon 20D & 5D & Rebels, Nikon D3, Olympus E-3 & E-520 & E30 & E-P1, Panasonic LX3 & ZS3 & G1 and have never seen auto white balance performance like this. Next the evaluative metering was exceptionally good too. In this picture I pointed the camera right at the bright lights and did a half-shutter press. 99% of cameras would have underexposed the scene, giving you two lights against a black background. These Canons were smart enough to know that that’s not the picture I was trying to take. Time after the time, the evaluative metering got it right like this. As for usage, both cameras were easy to use in the dark. A lot easier than some DSLRs actually where you have to hunt for a little button that briefly lights up the window that shows your settings. The S90 was easy to use because the two main controls — the ring around the lens and the back wheel — are easy to find in the dark, and the settings appear on the back screen very clearly as you change them. The G11 was particularly clever. It has little amber “courtesy lights” always on beside the exposure compensation wheel and the ISO wheel which allow you to read your settings in the dark. Beautiful. Both LCDs at minimum brightness were at comfortable level. I want to emphasize that the S90 is a really good low-light point and shoot, maybe the second-best in the world. It’s just that the G11 is a tiny bit better. In the second post, ebrandon posts some G11 vs S90 comparison pictures, and notes that the G11 has a slightly better color accuracy compared with the S90. He also shares a link to his Smugmug comparison gallery where full-resolution images from both cameras are properly labelled and can be downloaded. 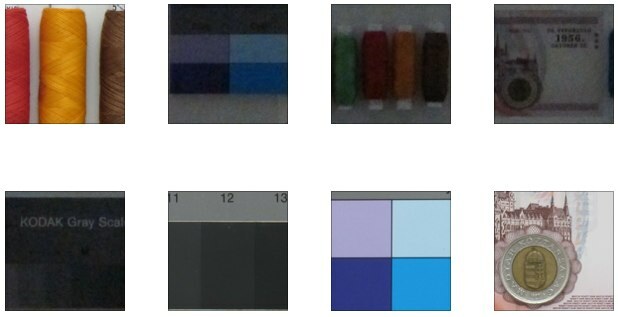 The two cameras are quite different from each other in operation but very similar in image quality as mentioned. With cleaner ISO performance now I think it increases the usefulness of these new pocket cams. For me, the S90 will be the camera to take when I need to travel extra, extra light. It can handle lower lighting reasonably well if needed, so it’s fairly versatile. But I find using the G11 much more enjoyable. Love the dials for quick access and the flip out screen for setting up shots when it’s more difficult to get behind the camera. And the bigger size is more comfortable to use. I also like the built-in ND filter of the G-series Powershot cameras, sometimes you want that creative motion blur of an extra slow shutter speed (waterfalls, vehicles, etc). I think they’ll make a pretty good combo. Or maybe the SX20 might be a better companion for the S90. Big zoom for lots of reach when needed and a nice EVF which comes in handy at times. If I had to absolutely choose only one, I’d take the G11. It’s still small compared to a DSLR, easy to carry and I think it’s a joy to operate. But the G10 was really special — premium quality look and feel with great attention to detail, better lens, and IQ that (in good light and 200iso or less) can rival or exceed that of some entry level DSLRs. I’m sure a lot of G10 owners have read http://www.luminous-landscape.com/reviews/kidding.shtml A truly impressive effort by Canon. The G11 still looks and feels like a good quality product to me, but the attention to detail just isn’t up to the G10’s It looks and feels good rather than special. I’ve seen other cameras go from a fixed to a moveable LCD and in every case they lost some of their sturdy feel (the G10->G11 is no exception). My initial impressions is that up to ISO 200 in good light the G10 has better IQ than the G11. They seem to even out around ISO 400 and beyond 400 I prefer the IQ of the G11. So if you shoot outdoors a lot or in great lighting — keep your G10. If you are like me and also shoot a lot in less than ideal conditions or shoot in places a flash is frowned on, the G10 makes a lot of sense. The Camera itself might not have quite the look and feel of the G10, but its still in the top tier of its segment.